India has its own versions of bread. The ubiquitous flatbread that is made from whole wheat flour and accompanies main meals not only in North India but it has become the staple of the South Indian kitchens as well. Daily meals are not complete without this quintessential flatbread that is eaten every day with utmost satisfaction. India is actually known for its world-famous wheat-based flat bread such as roti, chapati and paratha. There is a thin difference between roti and chapati. Roti is a little thicker and bigger in size than chapati. Parathas are totally different in taste as they are shallow fried and have crispy layers. All three pieces of bread are made with the same dough. Though roti and chapati are the healthier options as compared to paratha because paratha cannot be cooked without using ghee or oil but roti and chapati are cooked without applying any ghee, butter or oil on it. Ghee is brushed only after cooking them and that absolutely depends on the choice of the consumer. 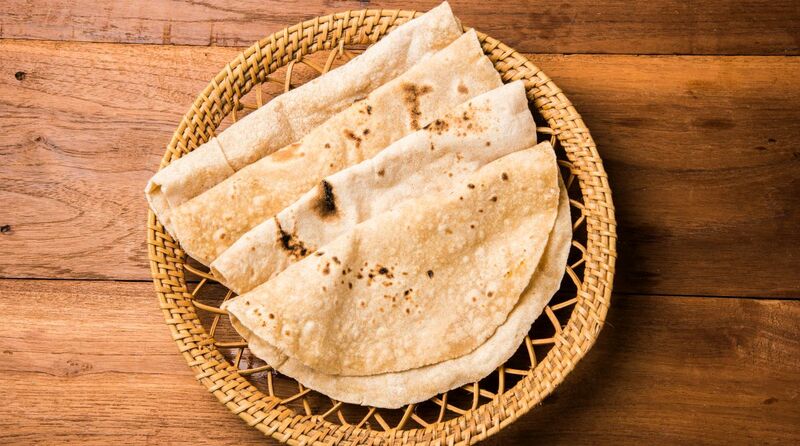 Chapatis taste better than roti because they are very thin and very soft to eat as compared to roti. They go very well with all Indian curry or dry vegetables. Also, this form of bread is not only popular in vegetarian households but it is equally famous in non-vegetarian families also. · When the dough is not perfect (it is not soft and pliable). · The dough is not rested for enough time before cooking chapatis. · If excess flour is dusted while rolling the chapatis. · If chapatis are cooked on low or high flame. · Use a good quality whole wheat flour. · While making the dough, use lukewarm milk in place of water. Add milk slowly and gradually while kneading the dough until you get the perfect softness, neither too soft nor sticky nor too stiff. If it is sticky or too soft, then add some more flour in it and knead again. If it is too stiff, add little more milk and knead again. It should be soft enough so as to show your finger impressions when you press them against the dough. · Knead the dough for 15 to 20 minutes adding a tablespoon pure ghee in two cups of flour to get the desired results. There is a science behind kneading the dough properly for making soft chapatis. Gluten (a type of protein) is present in wheat flour. The process of kneading enables gluten to make a matrix that holds its structure and fills the air in the dough. It makes the dough perfect to make soft chapatis. · Cover the dough with a wet clean cloth and give it a rest of 30 minutes, then knead it again for five minutes. · Make small balls out of the dough taking perfect segment size – neither too big nor too small. Roll the ball pressing in between your palms. Flatten the ball before starting rolling it. · Do not dust excess of wheat flour while rolling. Use only as much required so that the chapati should not stick on rolling board or rolling pin. · Roll the chapatis in circular motion rotating them on all sides and giving more pressure on the sides than the centre. Roll them thin, not very thin but medium thin spreading out the dough uniformly. · Always preheat the pan or tawa before cooking chapati on it. Turn the flame to medium while putting a chapati on it. Cook the chapatti from both sides on medium flame only. It will become hard if you will cook it on high or low flame. Cook it little more from the bottom side than the upper side. · When it becomes semi-cooked from both sides, puff it up directly on medium flame with the help of a tongue keeping the pan aside. As it puffs, turn it around and cook from the bottom for a second or two. · Take it off the flame. · Apply pure ghee or butter on the top surface and keep it in a closed container spreading a soft, clean white cotton cloth at the bottom of the container. If you are using a coloured cloth, its colour should be fast and it should not bleed. Store hot chapatis in a casserole with a lid so that they do not get dry. If you want to reheat them, heat them from both sides on a preheated pan on medium flame. Consume them immediately afterwards. While chapatis are everywhere in India these days, you will most often find them during lunch or dinner time being served alongside a curry, chutney, raita and pickle. It is a classic combination! Delicious in taste, looks so tempting as it puffs up while being cooked. You need little patience and practice to learn how to cook perfect chapatis. So do not give up if first, few do not have a proper circular shape like frisbee and as soft as mouth-melting. Freezing tips: You can also freeze the chapatis and use them up to 10 to15 days. Freeze them fresh when they are still slightly hot. Store warm chapatis in zip lock bags and freeze them. When you want to consume them, take them out of the freezer 30 minutes before, then heat them one by one on a pre-heated pan on medium flame. Consume them immediately after you reheat them because they become hard after cooling down due to the reheating process. Easy and light to eat-little tricky to make! The secret lies in the technique.